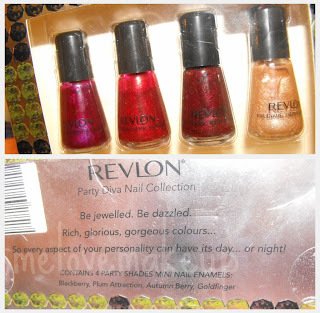 Sophsterlicious • UK Blog: Revlon Party Diva Nail Collection. This is a funny story.. I received these cute mini nail polishes for Christmas 2008 from my mum, Then I forgot about them and they were sadly neglected (I have too much nail polish!) Then about Oct/Nov time last year I re-discovered them, just in time for the festive season. 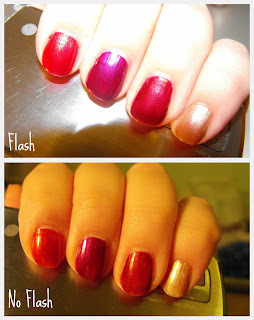 So I started wearing them, They are fab glam colours. Anyway, the funny thing is that for Christmas just gone, My mum bought me the exact same set again! It made me chuckle when I opened them on Christmas day.. When I told her she couldn't believe it, She said that they had another set of colours, but she went for those because she thought they were more me, and she was right. 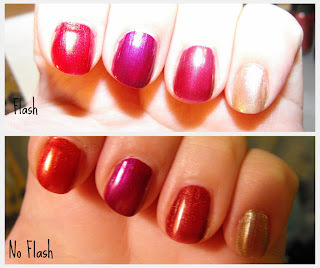 I love these polishes, They are really good quality, which is something I have found with all Revlon polishes, they last well, and you only need a couple of coats.. So, now I have two lots to get through, but that should be fine as they are only 5 or 6ml (Can't remember) minis and they will last me a while!